Cloth of Life: Destroyed by Alzheimer's, by Frances Vadla. Cover image. Frances Vadla came to Alaska from California in 1952, to "teach for a year." Instead, she met Norwegian Lars on the ski slopes, married him, raised two sons, homesteaded, and completed her teaching career. After retirement, she and Lars moved permanently to their homestead on the lake and built a log home to replace the prove-up house. When Lars fell victim to Alzheimer's disease, Frances became a full-time caregiver. After five years at home it became necessary to place him in the Anchorage Pioneer's home. At that time she enrolled in a poetry workshop with Linda McCarriston at University of Alaska Anchorage and began the collection of poems about Lars and the devastation of Alzheimer's disease. Linda's parting words - Don't waste these! have inspired this book. 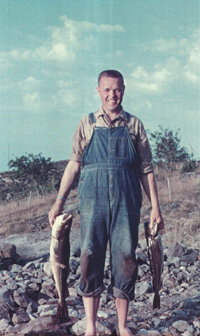 Lars as a young man in bare feet and overalls, holding a fish in each hand. Cloth of Life is presented here as a free downloadable PDF file, which has been provided by the original printers, Janai and Bob Jent of Alaska Legal Copy. Frances is happy to share this with all readers, but requests that you do not alter it in any way and that if you are able, please make a contribution to Alzheimer's Association Alaska Chapter, or your local Alzheimer's Association.